The Deer Farm and Park Demonstration Project was an initiative to provide a source of information for those interested in moving into deer farming and venison production to learn more about the farmed and park deer sector. The programme ran for two years through 2014 and 2015, and centred on ten demonstration days at deer farms and parks across Scotland. The initiative received substantial support through the SRDP Skills Development Scheme which is jointly funded by the Scottish Government and the European Union. Project partners are Scotland Food & Drink, the Scottish Venison Partnership, NFU Scotland and SFQC Ltd (Acoura). 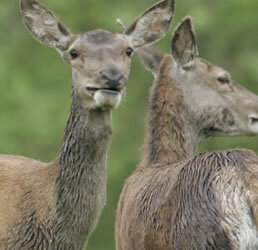 The project was delivered by the Scottish Venison Partnership through the Venison Advisory Service Ltd. The initiative was the first of its kind in Scotland and the UK, providing an opportunity for farmers and other land-based businesses interested in either diversifying into deer or developing a deer unit from scratch, to see established deer enterprises in operation, to meet with their proprietors and benefit from a programme of expert talks and demonstrations. The ‘demonstration day’ element of the project has now concluded. See the page Past Presentations and Papers for the presentations made during the project. A number of sources of useful information on the development of venison production in Scotland are also available below.